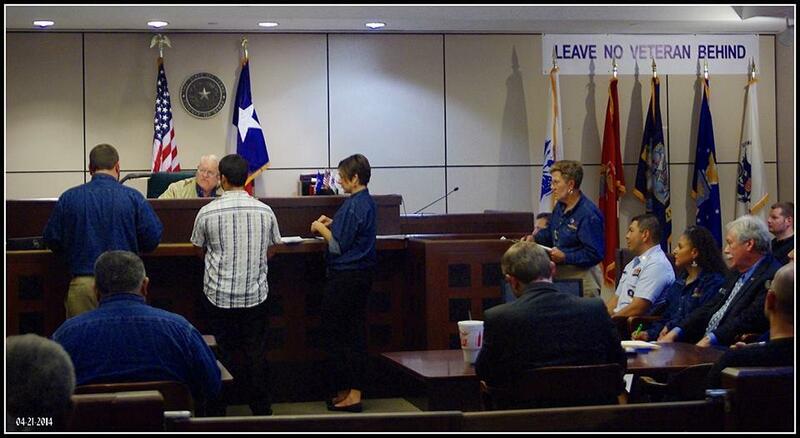 Judge Wayne Christian congratulates a veteran who completed the program in the Bexar Co. Veterans Treatment Court. District Attorney Susan Reed, Bexar Co. Sheriff Susan Pamerleau, and Bexar Co. 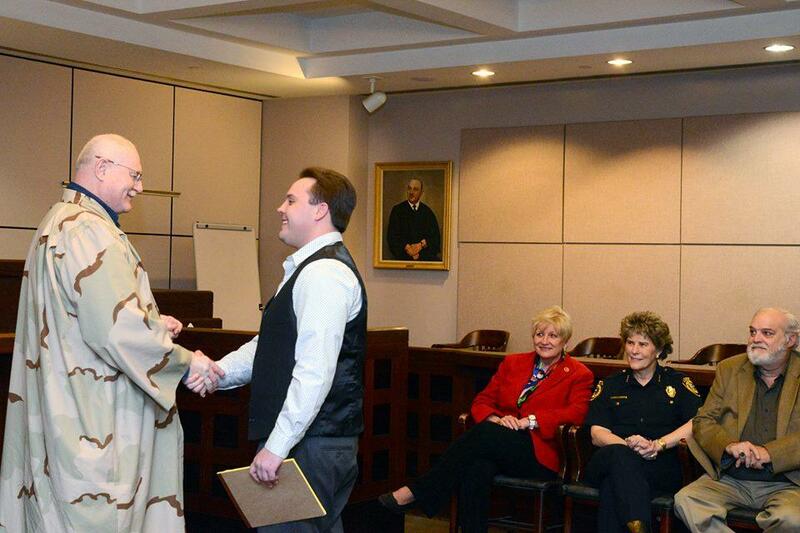 Clerk Gerry Rickhoff came in support of the program's graduates. Judge Wayne Christian, who has been running the docket every other Monday with state and federal grant funding, said county commissioners have agreed to continue to fund the court, along with future grants if they are available. Judge Wayne Christian listens as Probation Officer John Herman and VA Psychologist, Dr. Jill Koenig, Ph.D., discuss a veteran's progress in the program. "From day one we've been in the position that we'll be happy and proud to take any grant money that we can get our hands on and use that first before we utilize any taxpayer money," Christian said. "But we don't want to be coming back here every year and having this same conversation with county commissioners. But the issue is taking care of our soldiers." Defense attorney JoAnn Dehoyos, who represents many of the veteran offenders, told commissioners the court consistently demonstrates results in lives and careers saved, including that of a high security clearance individual who was arrested for a DWI. "He had the ability to even talk to a president. But when we found out about that, we went and requested pre-trial diversion so that doesn't impact him and he's able to continue his job," Dehoyos said. "Can you imagine the effect to that human being if he was not able to continue; he would lose that. That would have probably ruined his career and we don't know what would come after that." Dehoyos said the court’s best success rate for treatment is among veterans who tend to self-medicate and then appear for charges related to alcoholism. The court is requesting $371,000 to fund five positions, including a project director and a court manager. Although commissioners pointed out that none of the other specialty courts in the county have two management positions, they agreed to make sure the court does not go away. They proposed seeking new grant monies and using those first and stepping in the the general fund if there is a gap. The Source: Who Should Pay For The San Antonio Library? The San Antonio Public Library and the city are hoping to get more funds from Bexar County to run its public library system -- a lot more money. SAPL would like the county to pay $6.38 million, which is nearly double the $3.78 million the county already contributes. Part of their rationale is that the county makes up 19% of SAPL users, but less than that percent of the funds. The Bexar County Jail is preparing to change its inmate visiting system from face-to-face visitation to electronic encounters. The county is investing about $4 million in the system that officials say will improve security, cut down on overtime hours for guards, and help family members visit their loved ones more often. At the Bexar County Jail on Comal Street, hundreds of inmates have to be shuffled from housing units to special visitation areas where just 18 of them at a time can sit in a face-to-face meeting with their visitor.